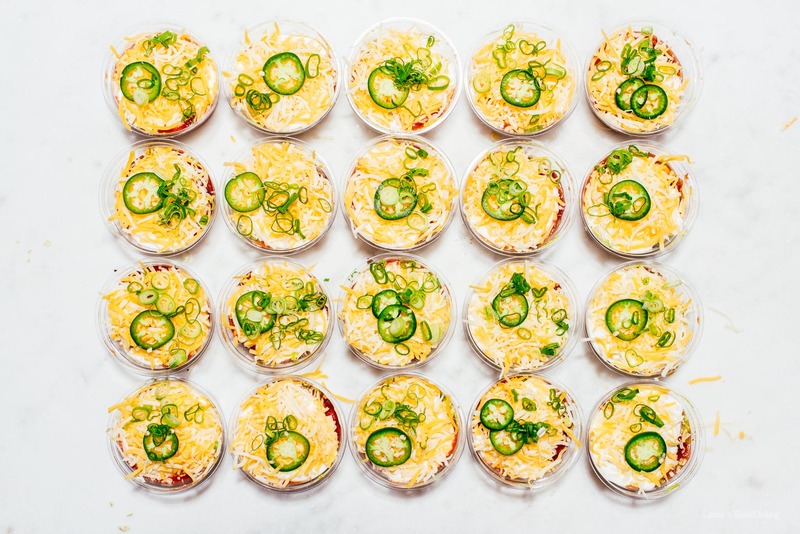 The perfect seven layer dip: taco meat, guacamole, salsa, sour cream, cheese, jalapeños, and green onions. Individually packaged up for portability and pot-lucks! I make a lot of notes when I cook stuff for the blog. Helpful things like, needs five more minutes in the oven, or definitely could use browning before braising. But sometimes, my notes aren’t really coherent. Like this time around, when I went to look at the notes for these individual seven layer dips, I opened the file with the recipe and found in the notes: DFC. I know the DFC isn’t a typo because I don’t actually use capitals, ever, except on the blog. So, naturally, I turned to Mike to see what he thought. Me: So, I’m looking at the seven layer dip notes…What do you think DFC stands for? To be honest I never actually figured it out, but down to cook sounds good to me. 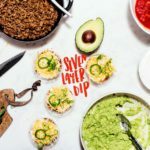 I’m definitely down for these seven layer dips, especially when I have no idea what to bring to one of those potluck type bbq parties that happen so often in the summer. I don’t really like bringing dessert because everyone likes to bring dessert and ever since that one time that I tried to deep-fry spring rolls on someone’s unreliable stove, I’ve shied away from that too. 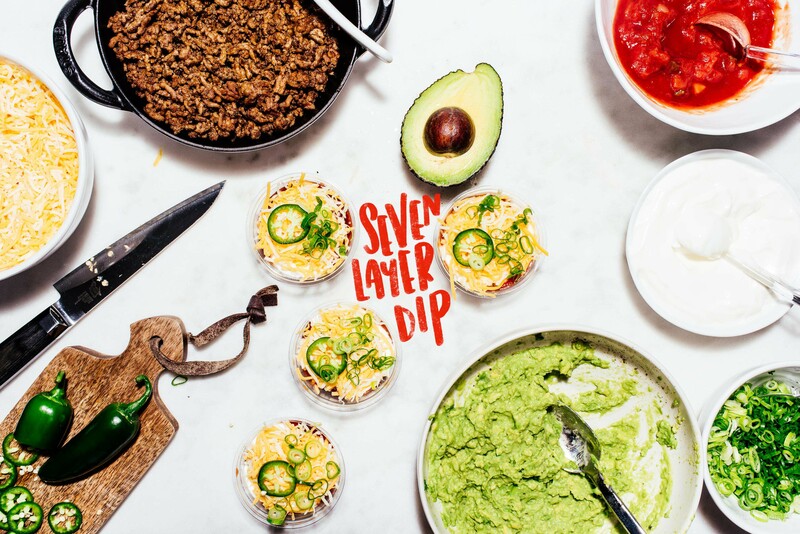 So, the answer my friend, to what to bring to potlucks is this: seven layer dip, individualized! I love that it’s not a giant platter of dip so you know that there’s no communal double dipping action going on. With these individual guys you can dip as many times as you want. And, you can customize them too. 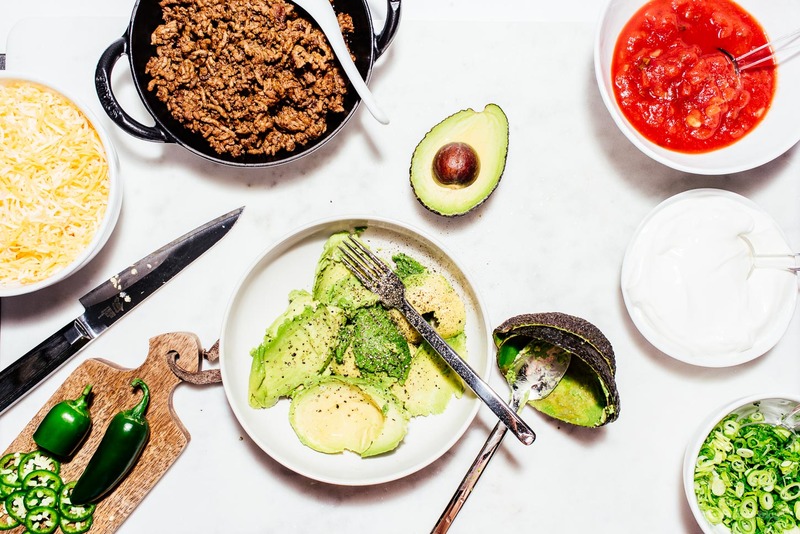 Most seven layer dips don’t have a meat layer – usually it’s refried beans – but as a nod to my mom, who hates beans, I substitute in taco seasoned ground beef. 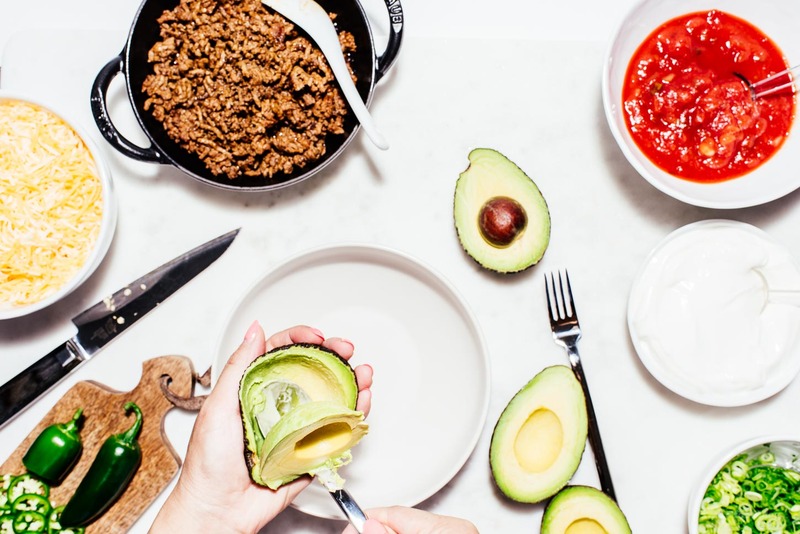 Growing up, my mom’s seven layer dip never had beans in it, so I’m partial to no beans. But, come to think of it, my mom’s seven layer dip didn’t exactly have 7 layers either, so I’m not sure what exactly I’m nostalgic about. Nostalgia aside, this is my perfect seven layer dip: equally layered proportions of taco meat, guacamole, salsa, sour cream, cheese; and then sliced jalapeños and green onions. Please make these guys for the next party you go to. If you do, I guarantee I’ll be in the corner, hoarding several containers of dip. 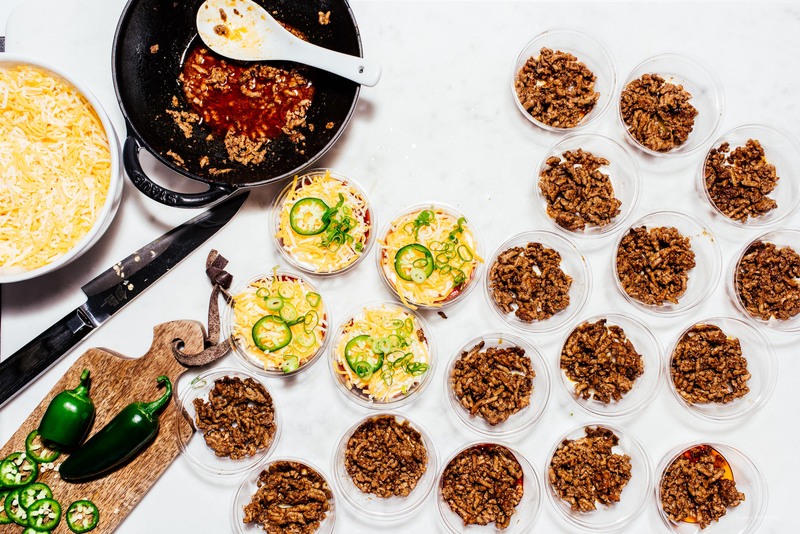 In individual cups, layer the ingredients evenly in the following order: taco beef, guacamole, salsa, sour cream, shredded cheese, jalapeños, and green onions. Keep in the fridge until party time and then enjoy with tortilla chips! In a skillet, heat up a bit of oil over medium heat. Add the onion and cook, stirring, until translucent, about 2-3 minutes. Turn up the heat and add the ground beef and break up, stirring until crumbly and cooked through. Turn the heat down to medium and add the spices and stir in 2/3 cups of water and cook down until thick and saucy. Remove from the heat and let cool, stirring every so often to help with the cooling process. 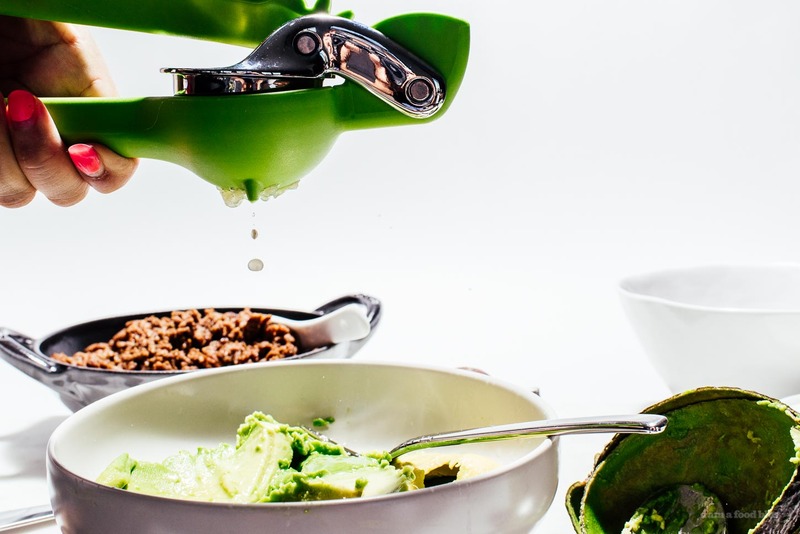 In a bowl, use a fork to roughly mash the avocado with the lime juice. Stir in the red onion, cilantro, and jalapeño. Taste and season with salt and pepper, adding more lime juice if needed. would it be wrong of me to make this, maybe a half batch just for my husband and i? I can stick the fridge right? That’s what normal people do? Thanks for the recipe! Just in time for my office tailgating party this Friday!